All Justice “Grey” Greystone wants for the holidays is a juicy rib eye dinner with his girlfriend Sydney Banfield. Well, that, and the 12 Days—or nights, in this case—of Christmas Syd has promised him. 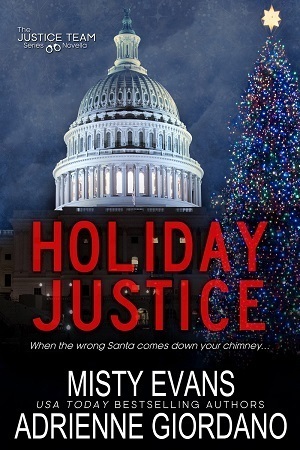 When his Justice Team partners, Mitch Monroe and Caroline Foster, discover a Santa sneaking around behind the restaurant, Grey and Mitch uncover a theft ring that’s leaving kids without toys and families without a reason to celebrate. But taking down the Santas could put Grey in hot water…especially if it ruins Christmas at Sydney’s shelter for battered women and children. Can Grey pull off the ultimate sting operation and save Christmas for Sydney and the shelter’s residents? Or will giving the bad guys a dose of holiday justice leave him with nothing but coal in his stocking?